April | 2012 | Wait... What? 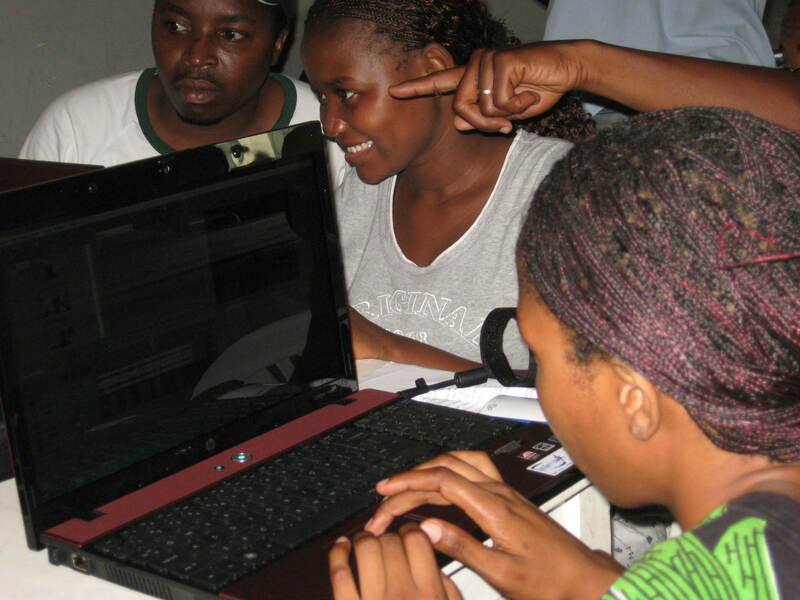 The field of Information and Communication Technology (ICTs) tends to be dominated by men. Is this because men are more suited to working in technology? Because women don’t want to? Because boys are more interested from an early age? Probably not. What is more likely is that there are factors throughout girls’ lives that discourage them from going into this field. At a personal level, I’ve been lucky enough to work in settings and environments that are largely positive towards women in this field. I’ve met and collaborated with numerous wonderful men who treat me with respect and who have been more than willing to work side-by-side, to help me out, to ask for advice, to share their own experience and information, and to support and promote the work I’m involved in. The fact that I work more on the social side of ICTs rather than the super technical, engineering or ‘coding’ side, however, may have something to do with my positive experiences. Many women who work on the more ‘techie’ side report feeling discriminated against, and the numbers tell a story that’s worth looking into. It’s the same, or perhaps more pronounced, the world over. In other parts of her talk, Fabiola recognized the important role that her parents played in keeping her in school and encouraging her to study for a career related to the sciences. This highlights the importance of not only education, but of positive parental and community support and a broader set of changes that allow girls to have more freedom and more opportunities. Girls need to know that they have options open to them. And boys need to know too that girls can ‘do stuff’. Women role models are important, and where there are not yet women in certain careers to serve as role models, positive support from men to encourage girls to explore their options is key. More girls and women in ICTs is not only an individual opportunity for women to earn an income. It can also mean that ICTs products and tools will be designed with women in mind. And I’m not talking about making things pink and purple to appeal to women, I’m talking about the design that responds to real needs in the real lives of women and girls around the world. As part of a broader effort to encourage more girls to consider wider options, ‘Girls in ICTs Day‘, was established last year and will now be an annual event on the UN Calendar, to be celebrated every year on the fourth Thursday in April. Positive attitudes and support from families, friends, communities, the private sector and the media is also part of the solution to helping girls see their potential. The Girls in ICT Portal offers statistics and advice on how to encourage more girls to consider ICTs as a career option. A version of this post originally appears on the World Bank’s Connect4Climate site. Twenty years ago, at the Rio Earth Summit, 178 governments committed to a series of legally non-binding principles designed to commit governments to balance development and environment in a way that would bring a more sustainable future. Principle 10, the first international declaration that recognizes the rights of people to hold governments accountable for their policies regarding the environment, was one key result of the summit. It provides a means for people to engage in the decisions made by political leaders and government agencies about environmental issues that affect livelihoods and long-term wellbeing. Since 2011, key stakeholders have been submitting ideas for the Zero Draft of the Rio+20 outcome document, to be discussed at the Rio+20 Conference in June 2012. Like Principle 10, the Zero Draft recognizes the need for broad public participation in decision-making, linked to a strengthened right to access information and to better civil society capacity to exercise that right. It notes that technology can make it easier for governments “to share information with the public and for the public to hold decision makers accountable” and that it is critical to work towards universal access to information and communications technologies. (Clauses 17 and 18). A recent analysis showed that participation, accountability, transparency, Principle 10/access to information and social inclusion/ equity are among the terms that share an ‘excellent’ level of interest among governments, UN agencies, civil society groups and other stakeholders. ICTs can play a role in supporting Principle 10 and Zero Draft, and pushing for appropriate mechanisms for response and redress. Mass media campaigns and communication for development (C4D) approaches have long been used to disseminate information and encourage environmental awareness and behavior change. New media has improved access to information and allows multi-channel communication rather than one-way broadcasts. Greater access to mobile phones and to new media channels mean that a broader population than ever before can be engaged in and/or participate proactively in defining and acting on Rio+20 and its outcomes. An effort similar to the open government partnership and the International Aid Transparency Initiative or the integration of sustainable development goals and Rio+20 commitments into these two efforts could be something to consider, along with a mandate for corporations to also open their activities to public scrutiny. On-line organizing combined with both online and offline actions (in places that have ready access to social media) can help the world prepare for Rio and to push for its outcomes to be implemented. Despite the great potential for ICTs in communication, change and accountability efforts, however; lack of access to ICTs and potentially low capacity to interpret data that might be presented on-line in such a registry is of concern in less accessible rural communities and among some marginalized groups. Therefore, there needs to be, “a more holistic understanding of the information cycle, including the creation, acquisition, assimilation, management, dissemination and ultimately the USE of climate change information, particularly within vulnerable contexts. Beyond the provision of climate change information, it’s necessary to consider if/how the information is being integrated -or not- into decision-making processes at the local, regional or national levels,” she says. The Children in a Changing Climate project uses a variety of participatory development and media tools for children and adolescents to explore and document climate change in their communities, and to share their findings and suggestions to adults and other decision makers. There is also a need “to identify, adapt and adopt innovative approaches for the effective delivery and the local appropriation of climate change messages, and most importantly, for the translation of information and knowledge -both new and traditional- into climate change practice.” This will require strong efforts as well as resources to create an inclusive environment that fosters greater participation, as mandated by Principle 10, and local ownership of sustainable practices. (More here on ICTs and the role of knowledge brokers). Building on Ospina’s observations on how to bring information to the “last mile,” meaningful ways to bring community knowledge and information into higher level discussions need to be found. Local communities have vast knowledge on resilience, climate patterns, local environments and local situations and histories that can be documented and shared using ICTs both to benefit themselves and to share at broader levels, improving South-South cooperation and innovation. Multi-media curricula such as the Children in a Changing Climate website bring together young people’s voices and opinions around climate change and environment. Post Rio+20, digital tools are one of many information and communication mechanisms that local communities and their citizens can use to confirm, validate, contest and dispute information related to compliance with commitments being put forward by those responsible for upholding them. Participatory media approaches can be effective in bringing community members as well as duty bearers at local, district, national and global levels into discussions about climate change and sustainable development. Why are you killing me? Girls in Kenya use poetry to engage adults in discussion on climate change. In summary, ICTs can play a strong role in education, participation and accountability processes if their integration is well thought through, appropriate to the context, and taking into consideration good participatory practices. Hybrid approaches that use a variety of online and offline tools can be effective for reaching populations and decisions-makers at different levels of responsibility, for ensuring that ICTs are not widening existing information and participation gaps and for upholding the goals set forth in Principle 10. Children and youth can and should play an instrumental role in bringing about awareness and accountability, especially since they will be the ones who reap the long-term results of the agreements sown at Rio+20. The Notes on ICTs, Climate Change and Development blog provides a wide range of research, commentary, and research on these areas. The Technology Salon (TSNYC) on the International Aid Transparency Initiative (IATI), held April 13th, offered an overview of IATI as a coming-together point for aid transparency. It also stimulated discussion on opportunities and challenges for organizations and institutions when publishing information within the IATI standard and shared some available tools to support publishing NGO data. Simon Parrish from Aid Info explained that IATI aims to provide information that meets the needs of a number of diverse groups, is timely, is ‘compilable’ and comparable, improves efficiency and reduces duplication. Simon explained that IATI arose from the 2005 Paris Declaration on Aid Effectiveness and was launched as part of the Accra Agenda for Action in 2008 due to a strong call from civil society to donors, multilaterals and northern NGOs for greater transparency. Organizations felt they were already working hard to be transparent; however governments, journalists, tax payers and others looking for information were not able to find what they needed. Rather than each organization creating its own improved transparency and accountability system, the idea was to use an open data approach, and this is where IATI came in. Since Accra, transparency and accountability have gained global traction and IATI has been a key part of this movement for the aid sector. Donor agencies, the World Bank, the EU, the US Government and others have already signed on to IATI and have started to publish basic information. INGOs are also starting to come on board and schedule their dates for publication to the IATI standard. It is hoped that over time the quality and amount of information published will improve and expand. For example, ‘traceability’ needs to be improved so that aid can be followed down the supply chain. Information from international and local NGOs is critical in this because the closer to the ground the information is, the better it can be used for accountability purposes. To complement Simon’s overview, I shared ideas on some of the opportunities that IATI can offer, and some common questions that may arise within INGOs who are considering publishing their information to IATI. concrete ways for communities to contest, validate and discuss aid information, intentions, budgets, actions, results. Is IATI the right way to achieve the goal of transparency and accountability? Is the cost in time, money, systems, and potential risk of exposure worth the individual and collective gain? Is IATI the flavor of the month, to be replaced in 2-4 years? What is the burden for staff? Will it increase overhead? Will it take funds and efforts away from programs on the ground? What is the position of the US Government/USAID? Will implementing agencies have to report in yet another format (financial, narrative)? Much internal project documentation at NGOs/INGOs has not been written with the idea of it being published. There may be confidential information or poorly written internal documents. How will aid agencies manage this? What if other agencies ‘steal’ ideas, approaches or donors? What security/risks might be caused for sexual or political minority groups or vulnerable groups if activities are openly published? Isn’t IATI too focused on ‘upward’ accountability to donors and tax payers? How will it improve accountability to local program participants and ’beneficiaries’? How can we improve and mandate feedback loops for participants in the same way we are doing for donors? Does IATI offer ‘supplied data’ rather than offer a response to data demands from different sectors? Ruth Del Campo discussed some of the different tools that are available to support INGOs and smaller organizations with IATI reporting, including Open Aid Register (OAR) which she created to support smaller organizations to comply with IATI. The Foundation Center has created a tool to support Foundations to enter their information into the IATI Standard also. Aid Stream is being used by many UK organizations to convert their data to the IATI Standard. Geo-visualization tools include CartoDB, AidView. Although tools exist and awareness around IATI is growing elsewhere, Ruth noted that in the US many organizations do not know what IATI is, and this is a problem. Another issue Ruth brought up is that most existing charity raters do not rate program effectiveness or program transparency. Instead, charities are judged based on overhead rates, growth, financial statements, and whether they are publishing certain information on their websites. These measures do not tell what an organization’s program impact or overall transparency are, and they do not trace funds far enough along the chain. Linking charity rating systems with IATI standards could encourage greater transparency and accountability and help the public make decisions based on program accountability in addition to financial accountability. (For background on INGO overhead, see Saundra Schimmelpfennig’s “Lies, White Lies, and Accounting Practices”). Because many INGOs are not familiar with IATI, a greater dissemination effort is needed for IATI to be of optimal use. If only 20% of the aid picture is available, it will not be very helpful for coordination and decision making. Many INGOs feel that they are already transparent because they are publishing their annual reports as a .pdf file on their websites and they have an overhead rate within a certain percentage, but this is not enough. Much more needs to be done to gain awareness and buy-in from US INGOs, government, charity rating systems, donors, media and the public on transparency and IATI. NGOs place great importance on their Charity Navigator rankings and Better Business Bureau reviews, and many donors select charities based on these rankings, so it will be important to link these with IATI. The Publish What You Fund index, which tracks the transparency of different organizations, has been helpful in getting countries and institutions on board. The Foundation Center lists transparency indicators on their site GlassPockets as well. The Brookings and CGD QuODA report was mentioned as a key reason that the US Government signed onto IATI at Busan last November, since the US was ranked very low on transparency and saw that they could bring their ranking up by signing on. Consensus at the Technology Salon was that it is not likely that the US Government or USAID will make IATI compliance mandatory for their grantees and implementing partners as DFID has done. Rather, the existing dashboard for collecting information would be used to report into IATI, so the dashboard needs to be improved and regularly updated by US agencies. One concern was whether in this scenario, the information published by USAID would be useful for developing country governments or would only be of use to USAID Missions. On the bright side, it was felt that movement within the US Government over the past few years towards greater openness and transparency has been massive. TSNYC participants noted that there seems to be a fundamental mindset change in the current administration around transparency, but it’s still difficult to make change happen quickly. Some members of the US Congress have latched onto the idea and are pushing for greater transparency and this could impact whether the IATI profile increases. Transparency and accountability are of interest to both major US parties. Liberals tend to be interested in the idea of being more open and sharing information; and conservatives tend to focus on value for money and stamping out corruption and lowering inefficient aid spending and waste. IATI can support with both and be a win for everyone. Making IATI mandatory could, some cautioned, backfire. For example there are foundations and corporations that for a variety of reasons do not openly share information about their giving. If pressured, the tendency may be to shut down totally. Showing what positive things can be done with IATI and how it can benefit CSO information management and coordination internally as well as externally was thought to be a better approach than positioning IATI as “we are being audited by everyone now.” IATI should be emphasized as an opportunity to join data together to know what everyone is doing, visualize the data using new technologies, and use it to make better program decisions and improve coordination as well as accountability. Some examples of vibrant and informative uses of IATI data include Mapping for Results, Interaction’s Haiti Aid Map and the Foundation Center’s comparison of Foundation giving and World Bank funding. Many organizations are investing in transparency for reasons that go far beyond IATI compliance. Three kinds or organizations were identified at the Salon session: those who comply because it is mandatory; those who comply because it’s inevitable; and those who comply because they believe in the inherent value of transparency as a core principle. Even within organizations, some teams such as Democracy and Governance, may be much more interested in IATI than, say, Education, Health, or Arts teams, simply because of the themes they work on and their competing priorities. It is hoped that in 5 years’ time, it is no longer a question of mandatory or inevitable compliance, but rather transparency becomes the norm and it starts to feel strange to work in a space that is not transparent. Leadership is important to get an organization on board. Some pushback might be seen around IATI because investment in IATI compliance may not be seen as providing an immediate return to individual organizations. TSNYC participants felt that rather than a constraint, IATI provided an opportunity for organizations to better manage their own information for internal sharing and use. IATI can help improve program planning, reduce time spent gathering program information from colleagues and across countries, and support better internal coordination among offices and partners. It was noted that when governments started publishing open data, the people who most used it were government employees for their own work. IATI can be seen as an investment in better internal coordination and information management. Once the information is available in an open format it can be used for a number of data visualizations that can show an organization’s reach and impact, or help a number of organizations share their joint work and impact, such as in the case of coalitions and thematic or sectoral networks. Concerns may be raised in some organizations regarding the state of project documents that were not originally written with publication in mind. Organizations will have to decide if they want to work retroactively, invest in quality control, and/or change processes over time so that documentation is ready for publication. TSNYC participants worried that without USAID mandatory compliance, some INGOs, and contractors especially, would not be motivated to publish information for fear of losing their competitive edge. It is feared that getting contractors to report to any level of detail will be difficult. This, the group discussed, makes peer pressure and public pressure important, and mechanisms to encourage broader transparency will need to be found. One idea was to create a ‘5 star system’ of IATI compliance so that organizations with full compliance get a higher star rating (something that Aid Info is already working on). Another angle is the hope that IATI reporting could replace some other mandatory reporting mechanisms, and this may be another entry point. It was recognized that IATI was initiated as a top-down approach to accountability. The question remains how to make IATI information more useful for ‘beneficiaries’ and program participants to track aid flows, and to contest and validate the information. What complaints mechanisms exist for communities where aid has not been effectively implemented? One point was that IATI is designed to do exactly that and that when it is more populated with information, then this more exciting part that involves playing with the data and seeing what communities have to say about it will start to happen. Simon noted that there is a huge emerging civic hacker and ICT for social change movement. Access to aid information can be hugely liberating for people. At some aid transparency workshops the focus has been on what national NGOs and governments are doing. Young people are often angry that they don’t know about this. They often find the idea that the information is available to them very exciting. Much of the conversation at these meetings has been about ways to reach communities and about who can be involved as intermediaries. IATI is still top down and the information that people need is bottom up. However the conversation is starting to happen. Infomediaries need to be multiple and varied so that there is not only one source of IATI data interpretation, but rather a variety of interpretations of the data. Social accountability processes like community score cards and social audits can be brought into the equation to extend the value of IATI information and bring in community opinion on aid projects and their effectiveness. Platforms like Huduma are examples of making open data more accessible and useful to communities. A huge thanks to our discussants Ruth Del Campo and Simon Parrish and to all those who participated in this 3rd Technology Salon NYC! Contact me if you’d like to get on the list for future TSNYC invitations. Our meetings are lively conversations, not boring presentations – PowerPoint is banned and attendance is capped at 15 people – and frank participation with ideas, opinions, and predictions is actively encouraged through our key attributes. The Technology Salon is sponsored by Inveneo and a consortium of sponsors as a way to increase the discussion and dissemination of information and communication technology’s role in expanding solutions to long-standing international development challenges. I was chatting with my pal Ernst Suur from War Child Holland and he alerted me to this instructional video they’ve made about using participatory video for monitoring and evaluation in Northern Uganda. Take a look. It’s worth it. Hint: Flip video cameras are fantastic for filming, but the Flip video format is incompatible with a lot of (most?) video editing software. According to Ernst, if you’re using Flip video cameras and need to edit, Windows Movie Maker Live is the way to go.